In three words: Thought-provoking, emotional, inspiring. Jasmine, Chelsea, and their friends attended a very progressive school, which was supposed to focus on social justice.Yet, there were social injustices being committed left and right on school grounds. Instead of giving up, Jasmine and Chelsea formed a club, Write Like a Girl, where they shared stories, poetry, playlists, and information regarding women's issues and information about those, who have been fighting for women. One of the things I really enjoyed in this book was all the extras we got with the narrative: the illustrations, the poetry, the prose, the op-ed piece, and all the other informative essays. It was brilliant the way Watson and Hagan used these pieces to educate the reader, and they sought to inform without being preachy. The same cannot be said for Chelsea. I gave her a little leeway, because I understood that she was a very passionate teen, but there were so many times she came across as one of those ranty white women. Her need to stir the pot ALL THE TIME was grating on me. Though, I did appreciate her struggle with her feminist ideals and subscribing to society's beauty standard, and I was proud of a big choice she made during the story as well. Chelsea was a little bit of a struggle, but you know, who I absolutely adored? Jasmine. I welcomed all her thoughts with open arms. Both Jasmine and Chelsea were frustrated with beauty ideals, but I found Jasmine's emotions so much more relatable. And, my heart broke for her and her family as they watched their father's illness progress. I cried just about every time dad was on page, and not just because it was sad for Jasmine, but because I thought he was pretty incredible. I loved how he supported not only Jasmine's growth, but that of her friends as well, by giving them different "challenges" to complete. But I didn't just cry for dad. I also cried during the big climax. I am a woman, who attended engineering school and worked in IT in the early 90s. Lots of sexism, and seeing these fictional young women rage for equality put a smile on my face, and made me wish I had half their courage when I was their age. This book wasn't all BIG issues though. There were also common teen woes and worries in there regarding crushes, friendship, and family, which the authors wove into the story quite well. Be butterfly stroke in a pool of freestylers. Overall: A really well written and compelling story of finding and making sure your voice is heard. **ARC received in exchange for an honest review. Do you like mixed format books? 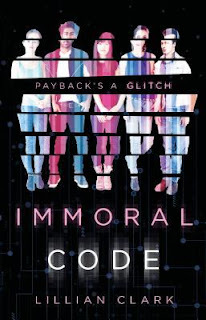 Immoral code sounds great, will have to pick this up! I am always up for a friendship story, and I thought Clark gave us a great one in this book. I really need to snag a copy of Immoral Code. That just sounds so good. I'm glad you enjoyed Watch Us Rise too. I thought the poetry included in the book was outstanding. 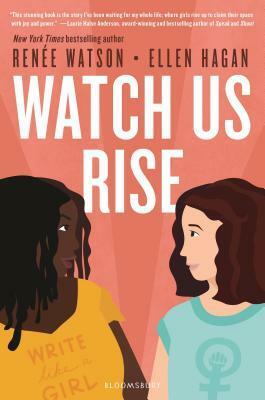 I am such a fan of mixed formats, and the authors used it so well in Watch Us Rise. I was definitely a fan of the poetry. That first one sounds like a book I would enjoy! I love that it was thought-provoking and the characters were layered. It sounds like it good just the right reaction from you too! I definitely was into everything they were saying, even if I found the one character's delivery a tad bit annoying. Lots of food for thought and I absolutely was cheering and feeling a sense of empowerment at the climax of the book. Great reviews! The first book sounds like what I see on Twitter every day. I guess it’s a timely book. AJ, you never fail to slay me. It's definitely a timely book, and I thought it was done well. I found it quiet inspiring. I've been curious about both of these, and I'm happy to see you enjoyed them both! Like AJ said, the first book sounds like it mirrors a lot of what's happening in the world today. As for the second book, I love stories with fierce friendships! Great reviews, Sam! I was curioous about Watch US Rise. It sounds inspiring, but I am not thrilled about the character who constantly looks for drama. The second sounds fun, and I don’t mind multiple POVS as long as it is done well. Chelsea got on my nerves a little, but overall, the book was very good. I don't mind multiple POVs, but it's a complaint I see often in reviews. I thought Clark did a good job making with her five characters, and I was able to tell them apart rather quickly. Immoral Code sounds so fun! It was fun, but it also touched upon the idea of the future and other things that teen their age are dealing with. Watch Us Rise sounds fantastic. I wonder if they wrote Chelsea that way on purpose. I hope she was called out on the page if that was the case though. Chelsea was sort of annoying, but she had some redeeming qualities. Her poetry was great. Other people might not find her as tiresome as I did. Immoral Code sounds great, and I love how strong you mention the friendships and loyalties are- and what they learn from their endeavour. Adding this one! I liked it. If you are up for a friendship story with a little romance, contemplation of the future, and a bit of a heist thrown in, this could be a great book for you. I really enjoyed your reviews and both of these sound like wonderful books. Both solid reads reads, which left me with stuff to think about. I love love the idea behind Immoral Code, but even more so because the friendship is at the core of it! 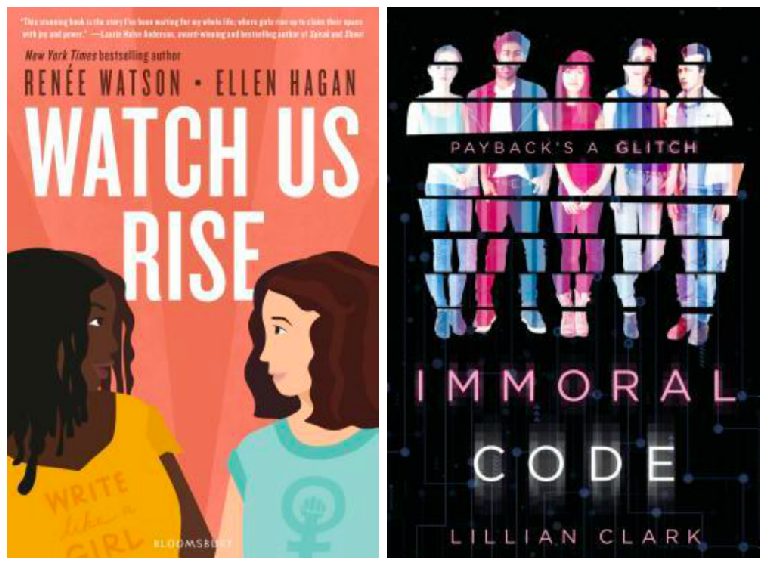 I would definitely classify Code as a friendship story with a little bit of heist and some coming of age too. Thanks for sharing some new to me books and authors. Glad I could introduce you to some new books. I went in with no expectations, and I got a great story of friendship, which I always love. I have seen a lot of people reading Watch Us Rise as it is one that is great for black history month. I am glad you liked Jasmine's character so much and found it to be so thought provoking. Immoral Code sounds so unique and yay for the representation in that one as well :) I don't mind so many point of views, to be honest. Watch Us Rise had a strong feminist focus, but Jasmine's character also touched upon issues of race, especially with respect to the type of roles carved out in the entertainment industry. Multi-POV books are ok with me, as long as each characters' perspective is clearly their's. Watch Us Rise sounds amazing, even if you had some issues with the character of Chelsea, it still sounds very inspiring. I love that it's not just feminism but racial issues which are explored. I think the fact the book addresses microaggressions which people experience, that those who do it may not view as being racist, is addressed because those are the things which can impact day to day. As for Immoral Code... yeah, as soon as you said 5 pov I was like nope. Not doing that. I hate too many POV and even if it works, I find excuses not to read. I just struggle with that many POV. I get bored of someone and then want to stop reading. Overall, Watch Us Rise was fabulous, and I swear, I was super pumped and inspired at the climax and nodding my head with many of the observations made throughout. The book is definitely straight forward and does not tip toe around issues that exist, and I liked the way Jasmine handled it. I know there are readers, who are not fans of the multi-POV, that's why I mentioned it.